4.5 out of 5 stars - LG G6 H872 32GB T-Mobile Locked 4G LTE Android Smartphone A++!! 28 product ratings28 product ratings - LG G6 H872 32GB T-Mobile Locked 4G LTE Android Smartphone A++!! Trending at $167.99eBay determines this price through a machine learned model of the product's sale prices within the last 90 days. Works great, clean ESN. clean screens, body may show light wear. Working Condition: (10/10) Physical Condition (9/10). 2 GB RAM, 16 GB ROM. Android 7.1.2. Supports up to 32 GB MicroSD card. 1.4GHz Quad-Core processor. 1.4GHz Quad-Core Qualcomm Processor. HD Voice Capable. In The Box. 13 MP (rear facing). 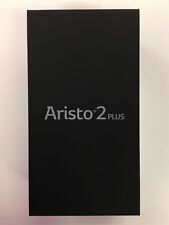 The LG Aristo M210 is a 5" Android Smartphone. It has a 16GB built-in storage that is still expandable up to 32GB via micro SD card. The device has been previously used and is in refurbished condition. Trending at $163.99eBay determines this price through a machine learned model of the product's sale prices within the last 90 days. Model : G8 ThinQ (LMG820TM). Color : Aurora Black. Manufacturer : LG. ESN Status: Clean (not Lost or Stolen) Paid Off/ Not Financed. The LG Aristo M210 is a 5" Android Smartphone. It has a 16GB built-in storage that is still expandable up to 32GB via micro SD card. Storage Capacity 64GB. Color Titan. 9/10 - Used (Mint Condition, very minor signs of use). No Contract Required. User Guide Not Included – Downloadable online. At our discretion we will repair or replace the item. 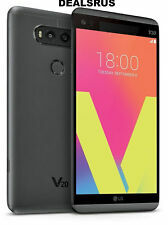 The LG V20 is a 64GB, 5.7" Smartphone that has high-end and over the top features. Multitasking at its finest as you can take still shot photos while recording videos. It also has a 3200 mAh fast-charging battery and as well as a fingerprint reader for added security. Warranty voided for any devices that have been opened. Storage Capacity 64GB. Network Technology HSPA , LTE, UMTS. Type Smartphone. Network Generation 3G, 4G. Color Titan. No Contract Required. New, Used, & Refurbished. Item has been used - Functions 100%. Trending at $105.63eBay determines this price through a machine learned model of the product's sale prices within the last 90 days. Condition: This phone is in like new condition 9/10 minor used phone is fully functional. clean esn It work T-MOBILE Comes with: phone battery battery cover Generic wall charger. IF YOU HAVE PROBLEMS WITH YOUR DEVICE. Model V10 H901. Network Technology GSM / WCDMA / LTE. Storage Capacity 64GB. Type Smartphone. Network Generation 4G. Item shows significant signs of use, heavy scratches on display and body. Great Deals On. Sim Card is not included with this item. Verizon / Page Plus / Straight Talk No Service. Warranty claims are subject to the discretion of the original product manufacturer. International orders are subject to the conditions as stated above.Warranty Claims. No Contract Required. At our discretion we will repair or replace the item. Cell Phones! Including but not limited to. Trending at $134.94eBay determines this price through a machine learned model of the product's sale prices within the last 90 days. LG is a South Korean electronics manufacturer that built its commercial success with televisions and smartphones. The brand manufactured some of the most recognizable Android products, such as the LG G6. Like many phone makers, LG makes carrier-specific editions and the company has had a long-lasting relationship with T-Mobile over the years. What characteristics make a T-Mobile LG smartphone? LG offers T-Mobile-exclusive phones and also offers versions of widely available models in a carrier edition. In either case, what makes a smartphone carrier-specific is that it is pre-configured to the service provider’s cellular network. It may also have carrier-specific software and features. It is notable that T-Mobile uses a GSM cellular network, which means that swapping SIM cards is generally all it takes to switch your model from one phone to another. Are all LG phones compatible with T-Mobile? It depends on the LG phone model. This carrier, in particular, requires a model that supports GSM. If your phone supports a GSM network, then switching to T-Mobile could work by purchasing the appropriate SIM card. You may want to check with your service provider to determine which card to purchase. Note that many non-carrier-specific models support GSM+CDMA, which means that they can operate on either network. What makes an LG phone a flagship product? An LG flagship unit is generally the most advanced LG smartphone. When an LG phone is a T-Mobile flagship, it generally means that this smartphone is this brand’s focal point for advertising, subscription plans, customer retention, and so forth. These product lineup leaders are generally introduced to the market on a seasonal basis. What LG models are available for T-Mobile? What features are common in these devices? The above list is definitely not all-inclusive. There are numerous other minor features that will further distinguish models that you should browse before you decide on the one that fits your preferences. Content provided for informational purposes only. eBay is not affiliated with or endorsed by LG or T-Mobile.